What Kind of Currency Option Trading Systems Are Available? The best currency option trading system is one that will suit your own particular style of trading. If you're a day trader, you might be better off simply trading the FX spot market than trying your hand at options. The FX options market and the right forex options broker provides a very versatile combination of possibilities. Unfortunately, because currency option trading is not so well known as stock and commodity options, to my knowledge internet technology has not yet provided the same versatility in broker trading platforms. You can use more advanced option trading strategies as part of your currency option trading system, but it means you will have to "leg in" to each position, paying a commission on each one and taking on the risk of slippage. But for the short term trader, FX options can be a relatively safe and highly lucrative way of trading. Unlike the spot market, the most you can lose is your investment amount, which means you can afford to risk a greater percentage of your trading capital, per trade. But with one exception, binary options, you are still subject to all the normal rules of options, including "the terminator" - time decay. This example will be using vanilla options. Vanilla options are your standard options, as opposed to other exotic forex option types such as binary options, currency futures options and barrier options. When expiration time arrives, you have the choice of converting them to either a spot position, or cash. The following example uses vanilla options on the GBPUSD currency pair and the bar chart below. For this example we'll be using data from the SaxoBank FX options broker site. Anyone can open a free 20 day practice account with them and, using either their web based or downloadable trading platform, get a feel for how your currency option trading system will work and the investment amounts involved. For example, you will observe that going long a vanilla put option for 50,000 units of the GBPUSD pair with a strike price of 1.5470 and expiration date one month out, will cost you about $US792. You can then leg-in (because their platform doesn't offer spreads) to sell another put option with same expiration but with a lower strike price of 1.5100 and receive $180 credit. You now have an overall put debit spread with a net cost of $612 plus brokerage. At expiration date, your potential profit if the spot market is trading below 1.5100, will be (1.5470-1.5100 =) 0.037 x 50,000 = $US1850 less the $612 option premium paid for. If above 1.5470 your options expire worthless and you lose $612 plus brokerage. Let's say $1,150 after brokerage, which is 87 percent profit on amount traded. At any time up to expiration however, you can close your positions. Using the above as an example of the amount of leverage and risk to reward involved, we can now apply any currency option trading system we like, including straddles, credit spreads, iron condors, calendar spreads, or covered calls if you wish to combine with a spot position. Straddles are only suitable when significant economic news is pending, such as the "non-farm payroll day" on the first Friday of each month in the USA. Iron condors and calendar spreads are range trading strategies. Or we may be happy to just choose to enter simple 'long' positions. Another currency option trading system might be to combine spot market positions with FX options on the same currency and use a delta neutral trading strategy such as outlined in one of the Trading Pro System videos. Unfortunately, although SaxoBank is one of the best forex options brokers around, it's trading platforms don't have the ability to run risk analysis graphs, so you will need access to one from somewhere else. But being a bank and therefore a forex market maker, the liquidity and versatility of option strike prices and expiration dates they offer make them an appealing way to trade forex in your own currency. Here's a forex option trading system with a difference. 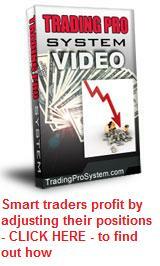 Watch this binary options trading video. You'll see how someone makes $593 in just under one hour from 7 small forex binary options trades. If you want more information about Binary Options Click Here.